It began in high school: she had a secret crush on him... and he tried to pretend she didn't exist. But Josh couldn't ignore her for long... not with her sacrificial love for people and her incredible smile. They ended high school as friends, and although life took them in different directions, they stayed in touch; growing in their ability to lean on each other and share life's difficulties together. Ten years went by without much contact, but God was doing incredible things in each of their lives! One day, after a simple "Happy Thanksgiving!" and two months of trying to schedule and reschedule a coffee date (Lauren INSISTS that her stove really did catch on fire and forced her to reschedule - it wasn't a fake excuse! ), Josh stepped out of his comfort zone to make his move and Lauren melted inside. The following months have a whirlwind of happy memories and continual reminders of why they are SO perfect for each other! 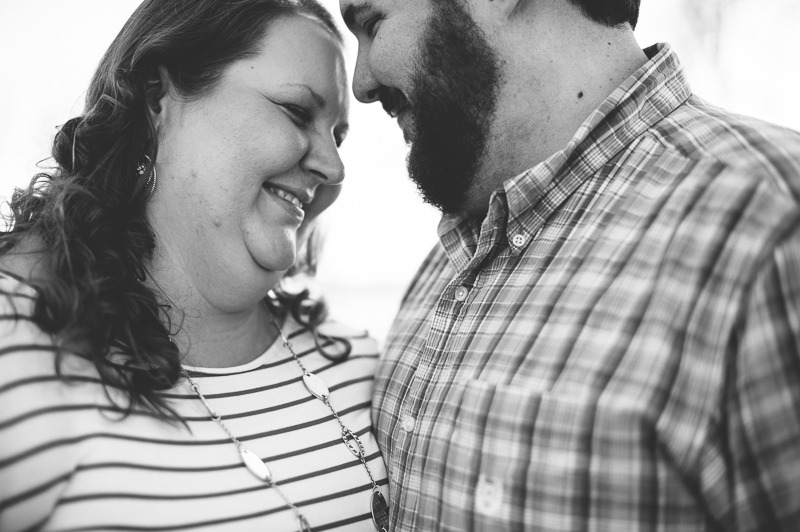 I'm THRILLED to photograph their wedding in April and I can't wait to see this look of complete joy on Lauren's face as she marries the man of her dreams!! We met up for engagement photos in Parkville last weekend and I drooled over her ring - SO gorgeous! One of the things I LOVE about Lauren and Josh's relationship is their ease and comfort with each other. Their decade of friendship has created a huge foundation for their love and it's so evident that they are completely relaxed in each other's company.